Drew Walking Tall is a fundraising effort headed by Nathan and Janel Gatten to raise funds for medical and Travel expenses for Drew while we visit a world-renowned surgeon in West Palm Beach Florida for reconstructive surgeries for Drew on May 3rd and September 27th. Drew has external rotation in his upper leg extremities and internal rotation below his knees. Since he’s been about eight months, Drew has done what I call the “booty scoot.” It’s an absolutely adorable maneuver where he combines hopping on his bum and raking with his right leg. As endearing as this is, it’s not a permanent solution. We’ve seen many orthopaedic specialists from Boston to Missouri to Tennessee, but it was a doctor in Florida that has the most experience with TAR Syndrome and congenital abnormalities. He has extensive knowledge and leadership in these types of reconstructive surgeries that has helped hundreds of children with previously grim potential for walking to get up on their own two feet and walk. In about six months, we will travel to West Palm Beach, Florida for Drew’s first surgeries to correct the rotation and install an external fixation device on one of this legs. We will be required to stay in Florida for three months as we have daily physical therapy and bi-weekly visits with his surgeon. Then, we’ll return home for a short period of time only to start the process all over again for the other leg. We have great insurance, but we will be responsible for 15-20% of all of the medical bills. In addition, there is living expenses for food, room, and other similar necessities. Luckily, I have been lucky to be part of a very helpful charity through a local bank to reimburse travel expenses for mileage, food, and room and board. However, this does not cover medical expenses. So, I’m organizing and hosting a variety of fundraising events to raise funds for some of these expenses. And, because this charity has been so greatly appreciated, I’m going to donate a portion of everything I earn through Drew Walking Tall back to this charity so other families with similar travel necessities in Union County can continue to benefit from this generous fund. I will be updating this page with events and locations where donations can be made. On May 19th, we hosted a Walking the Walk for Drew 5K and 1-mile fun run/walk at the Sturgis Airport. We had a great turnout. A total of about 127 runners showed up and we raised $5,160! Thank you to the Sturgis Airport, MHUC, Terry Rodgers, World Finance, all of my DWT volunteers, and the runners and walkers for coming to support Drew! Thank you to Laura Overfield for dedicating a portion of her 31 sales during the month of April for Drew Walking Tall. A total of $200 was donated to Drew Walking Tall as well as $200 worth of great products that were used as prizes at the 5K! Get ready for some blues, classic rock and jazz! Drew Walking Tall Music Fest featuring Dylan Barnes, HiRize Hillbillies, Doc Niehaus and Ryan Rigdon, Three Shades of Grey, Blind-Dog Gatewood, and The Iron Monkee Band on August 25th at the Renaissance Center in Morganfield from 11:00 am – 5:00 pm. T-shirts and food for sale. Will be collecting donations for Drew Walking Tall (we are halfway there!) Please come and enjoy the show! UPDATE: This event was a lot of fun and we raised over $700 for Drew! Thank you to all the bands and Sher Culbertson and all visitors for helping support Drew! Fooooooooore!! The Eagles Club will be hosting a Drew Walking Tall Golf Scramble on Saturday, July 14th at the Breckinridge County Club. Registration begins at 9:00 am and tee off at 10:00 am. $60/person gets you lunch and two complimentary golf clubs from Warrior. There will be a “longest putt” contest, “Chipping in a toilet bowel” game, and a half pot. Please join to raise money for Drew Walking Tall. For more information, you may contact Steve Utley, The Eagles Club, or the Breckinridge Country Club. Thanks for your support! On April 27th, the Lion’s Club hosted a magic show, with Roger Wayne and Dinky Gowen, at the Union County High School for Drew Walking Tall. They raised $750.00! On April 11th, The KC Hall of Morganfield will be donated all proceeds from BINGO! night to Drew Walking Tall. Doors open at 5:00 pm and BINGO! starts at 7:00 pm. So be sure to stop by! UPDATE: $600 was raised for Drew Walking Tall thanks to the Knights of Columbus. On March 31st, The Fraternal Order of the Eagles hosted a 9-ball pool tournament a the Eagles club with all proceeds going to Drew Walking Tall. The Drew Walking Tall auction will be March 25th from 1:00 pm to 4:00 pm at the Feedmill. We are featuring donated gift baskets from local businesses including a UK gift basket, a tour of golf courses, handmade wreaths, 2 1-week passes to the Union County Fair, sitting sessions with the best photographers in Union County and many more. Interested in donating a gift basket? Comment below and let us know. We’d like to have all baskets ready by March 10th. UPDATE: We made a total of $13,636 at the Drew Walking Tall auction. HUGE success! Wanna see pictures? 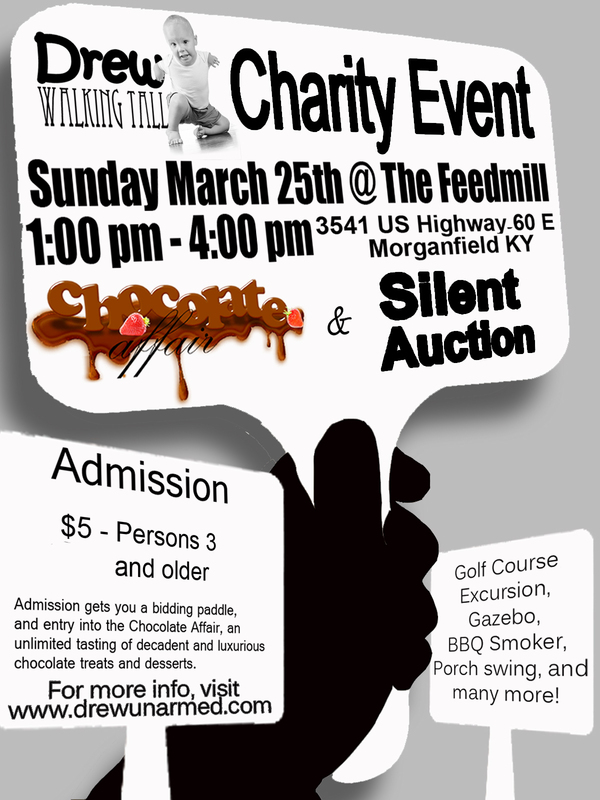 In addition to the auction, we’ll also be hosting A Chocolate Affair at the auction, an unlimited tasting of decadent chocolate desserts and treats for another donation to Drew Walking Tall. The Union County public schools, in correlation with The Fraternal Order of Eagles Club and WMSK, are running a Penny Drive in an attempt to raise a million pennies for Drew Walking Tall! Drop your pennies off in the marked locations. UPDATE: The six public schools managed to raise $5128.68 for Drew Walking Tall. The businesses will collect money until June so lets see if we can reach that million pennies! UPDATE #2: The businesses in Morganfield collected so much money that we reached the million penny challenge! A total of $10,000 was raised thanks to The Eagles Club, Union County Public Schools and WMSK! A special shout-out to Dairy Queen and Morganfield Elementary School for collecting the most pennies! The Union County Advocate will be selling candy for Valentine’s Day at their office on Tuesday, February 14th with all monies going to Drew Walking Tall. Stop on by and help Drew Walking Tall! UPDATE: Thanks to the Union County Advocate for helping Drew Walking Tall raise $808! You can donate money with your PayPal account (any amount you choose) or just with your debit/credit card. Click the “Donate” button below. Please visit my Drew Walking Tall Facebook page and “Like” the page to see updates and information about these events. Please also share the page with your friends! Look for donation jars at Danhauers, United Community Bank, Morganfield Home Center, Old National Bank, Frenchs, B&H, Deb and Jens, the liquor store, Verlies, The Feedmill, and Ryan Phillip’s tax office in Morganfield, Kentucky and leave me some spare change. Donation jars to be available in Alabama and Charlotte, NC soon! I need volunteers! 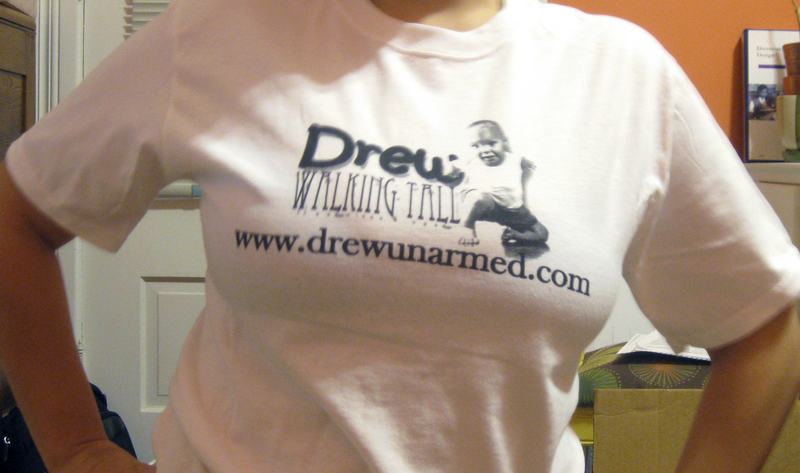 Ten Volunteers for each event get free Tshirts with the Drew Walking Tall logo! You may also make donations directly to Drew Walking Tall by visiting Old National Bank and depositing a donation in any amount to the Drew Walking Tall account of Nathan and Janel Gatten. I’m currently looking for product donations from businesses or individuals. One of the events I will be hosting is an online and community auction and need some fabulous items to auction off. Visit local businesses, share my story and see if they have any items they’d like to donate such as a gift certificate (only local restaurants and businesses please), picture frame, toy, etc. Any size will due, but I do need some big ticket items to really get people excited! Thank you so much for your thoughts and support. Please let me know if you have any questions or comments! Janel how can i pay for shirts for me and Casey? Can I get the shirts in kids sizes? My oldest daughter is in Ms Lisa’s class with Drew and I think her and her younger sister would both like one. LANE WAS SO EXCITED ABOUT MEETING DRU. HE REALLY WANTS TO HELP, SO HE HAS SET A GOAL FOR HIMSELF TO TRY TO SELL AS MANY SHIRTS AS HE CAN. WE WILL LET YOU KNOW WHEN WE HAVE AN ORDER TOGETHER. HAVE A WONDERFUL CHRISTMAS….. Thank you very much! I really appreciate that! Please make sure to indicate short or long sleeve and color choice. And, for his effort, I’ll give him a shirt too! Thank you! Is there a way to make a donation and get a tax deduction? It would need to be paid to a 501c3 non profit organization? I am a Morganfield native and although I haven’t lived in Union County for years, I still subscribe to The Advocate. Your story is both heart-breaking and inspirational. My son was in a near-drowning accident 8 years ago in another state from where we lived. His sister and I spent 8 weeks living in a hotel room while he was in the neurological ICU. If it weren’t for the kindness and generosity of family, friends, churches and strangers, we would have been bankrupt. An acquaintance gifted me with a large sum of money because she said she was once in need and someone had helped her and she was ‘paying it forward’. Now, I am ‘paying it forward’ to you along with my prayers. God bless you all. Thank you very much for your very generous donation. I have also been astounding by the kindness and generosity of my family, friends and strangers. I’m so proud of everybody and I can’t wait for all of these awesome generosities to manifest themselves with Drew walking. I hope that I can “pay it forward” someday too. Thanks again! I don’t remember how I landed on your site, but U read throu all of this. I am so amazed by your courage and upbeat attitude. Yes I am sure Drew is full of lfe and he brings you joy all the time. i will pray for your journey through life with this special child. FYI I sent you an email about your need for video and Internet while you are in florida. Both of my children go to Morganfield Elementary with Drew and have told me how “cool” Drew is for the past several months. This means a lot since my son is 10 and daughter is 8 and Drew is so much younger than them. I really did not pay much attention to their comments about Drew until they came home this week talking about the Penny Fund Raiser at the school. They are really excited about finding ways to help Drew walk. My daughter just had a birthday and has thirty dollars left from her big day. She has decided to donate it to Drew (I’m shocked). Normally, she would just ask me for more money and keep hers. I really think my kids would like t-shirts. An earlier comment asked if you had kids t-shirts, but I didn’t see a response. Please let me know. Also, I am going to encourage them to sell t-shirts. They can be very persuasive! Our family will be praying for Drew and your family. Remember to stay strong and lean on those around you. God Bless. Hello Janel, My name is Wendy Adams and I’m a Youth leader at Morganfield First Baptist Church. Our church is doing baskets for the auction on March 25th at the Feed Mill. I love this idea. I have been praying for your family and for Drew. He is a real inspiration to all. I was wondering if you and Drew could come and talk to our youth at Morganfield First Baptist? I want these young people to understand and see the real need you all have with Drew and his up coming sugeries. I know you have some trips coming up in May and September and will need some help with all kinds of items such as household items, toys for Drew, food for the trip, etc. I would like to see these kids get to know who they are going to help and see this all the way through. Maybe we can use your blog here to talk to you from time to time. I have been praying for a mission for our youth to do and the Lord keeps leading me back to this blog of yours. I think this is something he’s wanting me to do with our youth. This is something that’s not going to end after the auction on March 25th and that you will continue to need support and help from our community. What do you think about coming out and speaking to our youth group? Please contact me at my email address or you can contact me by phone at 270-952-1594. Thank you for your time. And God Bless you. Amazing story and a very remarkable little young man , my heart goes out to you ,i found this site thru a link from Jeremy Bakers facebook and have heard of a silent auction , if you are in need of donation for the auctions , would you please let me know by phone or email , i own an operate 5th street signs, in Sturgis . Phone is 333-3989 and email is 5thstreetsigns@att.net , i can and will donate something to help. He is an inspirtaion , and make sure u let us know . He is! He says, “it’s jus’ my size.” Thanks for giving it to him. I really have tried hard to find a ball about that size…either I find balls the size of tennis balls (which he can handle ok because he can use his right cheek to hold it against) or basketball size and that’s really awkward for him, though somehow, he makes it work! Another fund raiser idea would be a poker run which is for donations and can be for motorcycles too Alan at Paradise video would be able to give more information and I’m sure he would be willing to help. That is an awesome idea. We are wrapping up our current fundraising efforts this year as we’ll be leaving very soon for Florida (end of April), but we’ll be doing additional fundraising in upcoming years as other surgeries in Florida are required. Thanks so much! I just placed an order for some additional shirts and I ordered a bunch of extra white shirts. I won’t have enough time to place another order for customized colored shirts as our trip is coming up. Do you live local (Union County, Kentucky)? If you do, we can meet and exchange. If you aren’t local, email me at drewunarmed@hotmail.com and I’ll send you my mailing address. Thanks! Things are going good here. Serenity is doing great. Her right arm has turned in some since her second surgery. Her right arm is shorter than her left. But as far as she is concerned, she’s happy and can do what she wants so the thought of any surgeries at this point aren’t in the picture as far as she’s concerned. They have mentioned the lengthening procedure a few times but that will be her decision and as of right now her answer is “NO”. We will keep you guys in our thoughts and prayers. Hey Janel we miss you here.